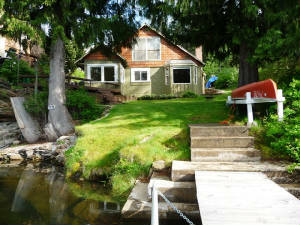 View of the cottage from the dock. 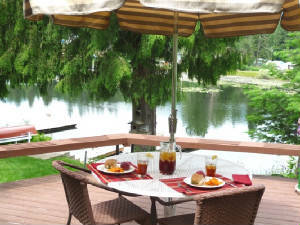 Enjoy a BBQ on the deck overlooking the lake. Welcome to your Waterfront Holiday Cottage! Sitting on the channel connecting two lakes, Narrows Cottage lake house has approximately 1,300 square feet of inviting living space. The house has 2 bedrooms, 2 bathrooms, living room, kitchen, dining room, and laundry/mud rooms. 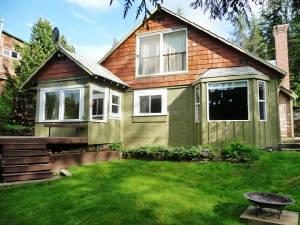 The atmosphere is one of relaxation and warmth to which you and your family can come back to after a day on the lake or after enjoying the many area attractions such as the Silverwood Amusement Park, Coeur d'Alene, nearby Farragut State Park, or our local par 72 Twin Lakes Village Golf Course. The upstairs bedroom, kitchen, living room, dining room, and deck all overlook the lake. Carpeted decking next to the "beach"
Upstairs "Family" bedroom with bathroom. Main floor bedroom with attached bathroom. After a day on the lake snuggle under the 600 thread count sheets. View of the kitchen from living room. The dining room is on the other side of the kitchen. 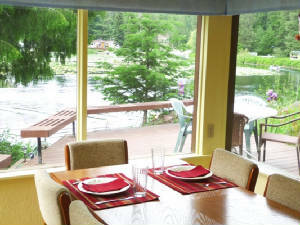 Window wrapped dining room overlooking the lake. Enjoy a peaceful brunch in the sunkissed dining room. Deck, yard, and firepit all overlook the lake. If you would prefer to motor around the lake instead of row we have a four-stroke, four horse power motor available for rent. 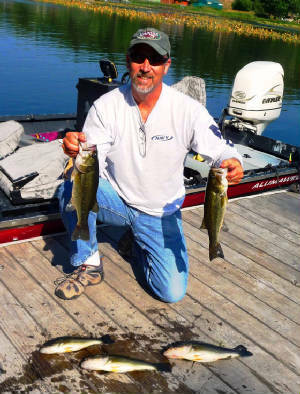 The motor does not require the mixing of gas and oil, but it does weigh 60 pounds, and you would need to be able to mount it on the boat and take it off when done. Of course the row boat and canoe are free to our guests and you don't need to rent the motor to enjoy the lakes. Price for motor rental is $200 with an extra deposit. 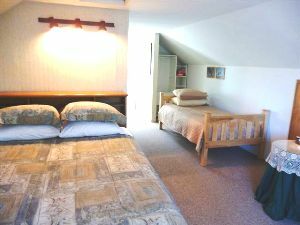 The bed situation in Narrows Cottage is the following: Main floor bedroom has one queen bed. The upstairs bedroom has one queen and three twin beds. 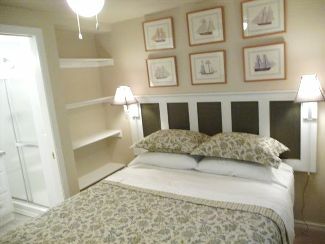 Narrows Cottage has enough beds for a total of 7 guests. Docking station for your iPod / MP3 Player in each bedroom with clock/alarm features. 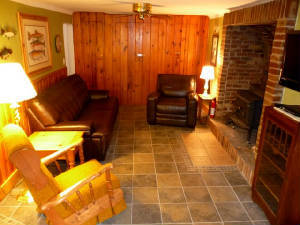 Seating in the living room consists of a leather couch, leather recliner, and rocking chair. 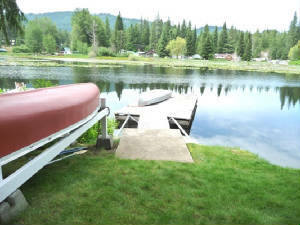 Private 10 X 20 foot dock ready for your use with the provided rowboat and canoe. 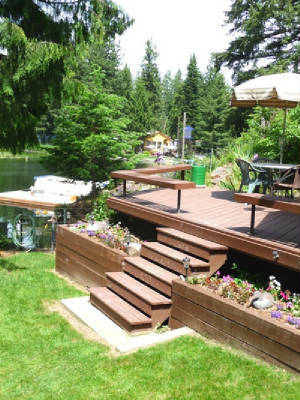 Part of the deck and yard overlooking the lake. 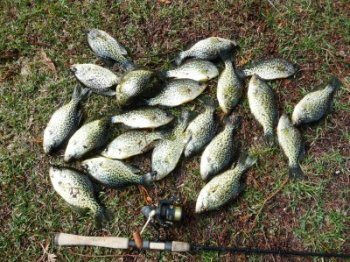 Crappie caught off the dock! Silverwood Theme Park - video of the new roller coaster. Close to Narrows Cottage, come back for lunch and save some money to spend at the park! 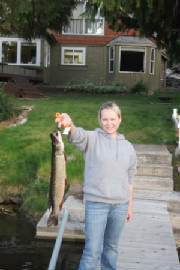 Idaho Fish and Game video of fishing on Twin Lakes. Note that Upper Lake is warmer than Lower Lake, they have it backward on the video. Whether it's relaxing or partaking in all the activites of the area we want our guests to have their best vacation experience here. Let us know how we can help!